FULLY RESPONSIVE Websites that Look and Function Perfectly on Desktop, Smart Phones and Tablets! To compete in today's market, you need more than just a great website. We combine our expertise in website design and Internet marketing to ensure you have the most effective new patient generating website possible. Our websites are designed and engineered with all the right features in all the right places to convert viewers to patients quickly. In addition, we use a comprehensive Internet marketing strategy that increases traffic to your website. If your website looks generic and outdated, so will you. View our featured dental websites and call us today to learn about our Go Mobile First Dental Website and Internet Marketing special offer! View our featured fully responsive websites by clicking here. Google Reviews Generator - makes getting Google Reviews quick and easy! Automatic Rave Reviews Rotator - Potential Patients and Google loves this feature! 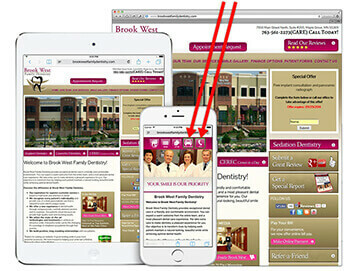 Customized Dental Specific Content that promotes your practice. Fully Custom Content is also available. On-line Forms include: Appointment Request, New Patient Offer, Free Report, Patient Survey, Cosmetic Analysis, Patient Registration, Refer-a-Friend, Newsletter Signup, Contact Us, etc. Website Performance Tracking services include: Google Analytics, Contacts Database, and Call Tracking. For more information about our high quality custom dental Website Design and Internet Marketing services, call us at 888-906-1667.